… and there is a place in a choir somewhere for everybody. Frank joined our choir a while back. He hadn’t sung for ages, but gave it his best shot for a couple of sessions. Then he wrote to me saying that although he’d had a great time and thought the choir was fantastic, he wasn’t going to continue because he couldn’t always produce a note accurately and he felt that he didn’t have much of a vocal range. I wrote back to say that pretty much everyone else in the choir was in the same boat! This led me to think about the experiences that people have when they first join a choir and the assumptions that they bring with them. Most people who have not trained or had singing lessons think they can’t sing. I tell people that I earn my living by running choirs and singing workshops based on the principle that everyone can sing, but they are quick to let me know that they are the exception and can’t sing a note. This is the first obstacle for someone joining a choir. They assume that everyone in the choir can sing much better than them, and that they need to be of a particularly high standard to even have the gall to think of joining such an auspicious group of people as a CHOIR. Of course, there are professional choirs out there, and choirs who audition their members. But there are also many, many community choirs, non-performance choirs, open-access choirs, choirs who sing for fun, choirs who don’t even call themselves ‘choirs’, and so on. There will be a choir out there for you who will embrace you with open arms and whose members’ singing skills are pretty much the same as yours. Do your homework first though. If you are really inexperienced and under confident as a singer, then probably not a good idea to audition for the local professional ensemble! Start small. You may join a choir and not feel at home. Every choir has its own ‘flavour’ and group dynamic. The repertoire may not interest you; they might move at a learning pace that’s just too fast (or too slow) for you; they may insist on using written music and you may not be a sight-reader; they might be a performing choir whereas you just want to have fun. Whatever the reason, the first choir you join may not suit you. It’s nothing to do with you, just the wrong choir. Try another one until you feel comfortable. When you first join a choir you will assume that everybody knows more than you and they are much better singers than you. This is partly because the people already in the choir are used to the musical director’s strange ways. They’ve indulged him over time and are familiar with his foibles and teaching methods. They are aware of the kinds of songs he introduces. They are used to the warm up and way in which the choir stand (or sit) to rehearse. This is simply a matter of unfamiliarity so you’ll need to give it a few weeks before you begin to feel comfortable. However … there is a very good chance that everybody else in the choir feels as under-confident as you! Even though they’ve been in the choir for a few years, many members will feel that they have limited range, difficulty learning the tune (and the words), are not as good a singer as the other people in their part, don’t have a particularly beautiful voice, etc. etc. But what they may be good at (and this is something I try to drum into my own choir) is to behave as if they are great singers and know what they’re doing. Just by pretending like this, they come across as confident, able singers with not a care in the world. You will learn this trick too! I always make a point of starting each new term with completely new songs that nobody in the choir will know. I point this out to any new members, so the first few weeks are a completely level playing field and everybody is in the same boat. This helps newcomers to relax a little and discover that even the old hands take a while to learn new material and stumble badly sometimes! It can be a little daunting joining a large group of people who already know each other. It can appear at first glance to be a bit cliquey and hard to break into the group. Yes, it’s true that many choir members have become friends, but it’s also true that the basses, for example, won’t know all the altos, and vice versa. People also look cliquey in each part because they’re often worried about getting things wrong so cling together for mutual support! Every choir that I’ve ever run is super-friendly and make new members welcome very quickly. They’ve been there themselves at some point in the past. A choir is all about team work, especially if it’s a harmony-singing choir. So no new individual is a threat, rather they are extra support to existing members. And who knows, maybe the new member can pick things up quickly and help the others! Many people without a musical background don’t understand the notion of ‘parts’, certainly won’t know technical terms like ‘second soprano’, and probably won’t know where their vocal comfort zone is. When someone joins the choir I ask them whether they like to sing high or low. Even that can be confusing. How high is ‘high’? So I usually demonstrate the range for each part of a new song to help people decide. With a community choir, none of the parts are that high, and none of the parts are that low. Probably nobody in a community choir is a true ‘soprano’ or a true ‘bass’. Most of the men will be baritones (i.e. sitting uncomfortably between the tenor part and the bass part, not truly belonging to either), and most of the women will be altos (although maybe not able to reach either the highest or the lowest alto notes). So in a community choir, the arrangements are usually for an alto/ baritone choir. The tenor part is not too high for the men, yet not too low for any women who want to sing it. In fact, pretty much everyone in the choir could sing any part. There is, however, a difference between the range of notes you can sing (how high or low you can go) and where you are most comfortable in singing. This latter has a technical name: tessitura. It’s the range of notes that suit your voice, it’s where your particular type of voice feels most comfortable and shows itself off to its best. That is not necessarily the same as the total range of notes that you are able to sing on a good day, but may be more limited. Melanie in our choir always sings in the tops. She sings in her ‘head voice’ (that is her voice which sounds high and light like a girl in the school choir), although not terribly well to be honest. When we do the warm ups it turns out that Melanie has a wonderful low voice hiding in there. She can hit very low notes in her ‘chest voice’ (the voice that we use in everyday speaking) and they sound wonderful: warm, dark and resonant. That is her natural tessitura. But Melanie doesn’t like singing there! For probably cultural and historical reasons she feels that ‘proper’ singing is when she sing high in her head voice. Ah, well, we’ll just have to let that one go! A choir can be a very large group of people. Even the smallest choirs usually have a more than 20 singers, so with a three-part harmony song, there might be six other singers in the part with you. So who will notice if you don’t show up for a concert? You’re only one voice, and not a very good one at that. Nobody will miss you, six voices sound pretty much the same as seven. But what if everybody in the choir thought like that? What if the other six singers in your part didn’t turn up because “nobody will miss them”? Then we don’t have a choir! A choir is an organism that is defined entirely by the singers who make it up. Everyone is as vitally important as everyone else. If the singers don’t come, then the choir just doesn’t exist. Every individual’s voice makes a vital contribution to the overall sound of the choir. If it were a different bunch of singers, it would sound different. You do count, you are important, so please turn up to the concert!!! But nobody here looks like me! Imagine you are a bloke and turn up to find a room full of women, or you are a black woman walking into a sea of white faces, or a 20-year-old surrounded by 50-somethings. It doesn’t feel like your tribe. Maybe you don’t belong. Maybe you shouldn’t be here. Choirs in general, and community choirs in particular, are egalitarian places. Everybody is equal in status. No one singer is more important than any other. It is an inclusive group of people where you are judged solely by your willingness to join in. So, in theory, there are no barriers of race, age, gender, disability, nationality, language, etc. Oh, to have a truly multicultural choir which spans the generations! The reality is though that any given choir often reflects the demographics of the community that it is based in. But even then, it may not be a true reflection. My first choir was based in the Midlands of the UK, a region well-known for its multicultural make-up, in a city which has a huge range of ages, races and nationalities. 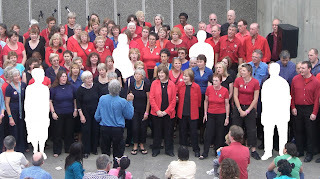 But the choir ended up being predominantly middle-aged white women! So if you walk into the choir and there is nobody there like you, then see yourself as a pioneer who is helping to mix things up. You will be warmly welcomed and soon made to feel at home. Then one day, when another person similar to yourself arrives at the choir, they will see a familiar face and perhaps be more inclined to stay. If you stay, you might never leave! After I wrote back to Frank, he decided to give the choir another go, and now he is firmly ensconced as a bass. If he’s anything like the other members we’ve had over the years, he may well be in the choir forever! I was glad that I’d challenged his assumptions, and I think he was quite surprised to discover that most of the other choir members had the same misgiving as him, even though they’d been members for some time. So don’t let your assumptions and pre-conceptions put you off or you’ll be missing out on something wonderful. Get out there and join a choir!